The Multi-Recycler is a sturdy, free standing, 6 gallon bin is an ideal recycling bin for small spaces. 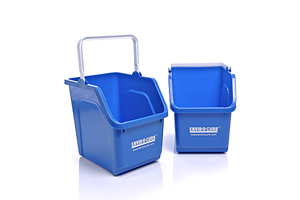 Lightweight and space efficient, this bin has a slanted opening for easy access and a liquid retention reservoir to prevent residual liquids from making a mess. Using a unique patent pending design, this container stacks easily to create a multi-purpose recycling station. Priced - Single Units $12.95. Shipping and Taxes Extra.